Finish off your signature burger, french fries, or salads with this Choice 12 oz. clear squeeze bottle. This bottle's versatile, simple design is ideal for both back-of-house and front-of-house applications. Serve a variety of condiments including ketchup, barbecue sauce, buffalo sauce, or even olive oil and salad dressings. 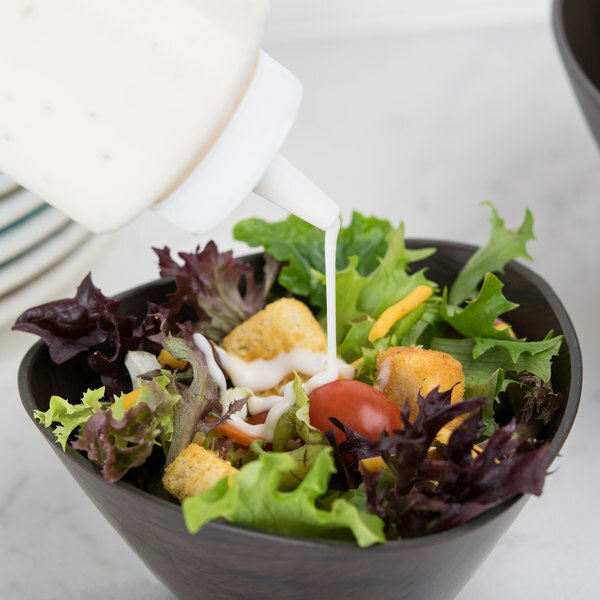 Whether you're using it in your kitchen to complete your culinary creations or placing it in a self-serve area for guests to use, this Choice squeeze bottle will make adding condiments to items a breeze. "The price can't be beat! And these squeeze bottles can be used for so many things- salad dressing, olive oil, mayonnaise, mustard, syrup, and more! The hole in the cap is the perfect size. Easy to clean!" 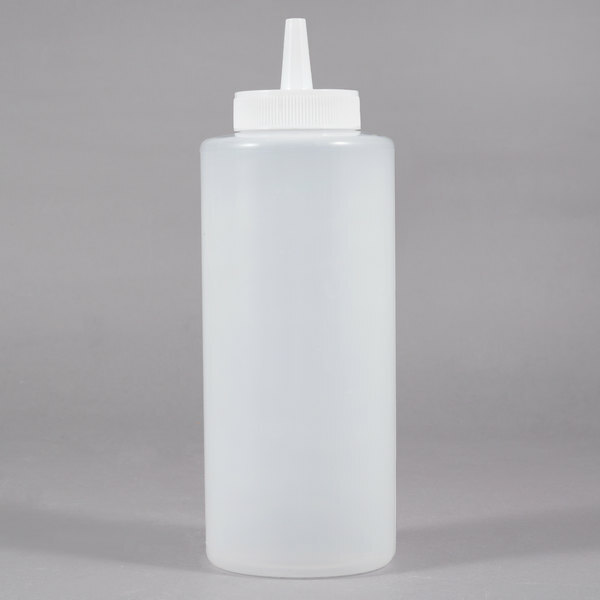 Made of durable yet flexible plastic, this bottle is easy to squeeze and allows for fast application of condiments. Unlike condiment pump dispensers, it gives you and your customers complete control over the amount of topping applied per squeeze. The clear construction is a professional option for your establishment. It provides easy product identification as well as makes it easy to track product levels at a glance. 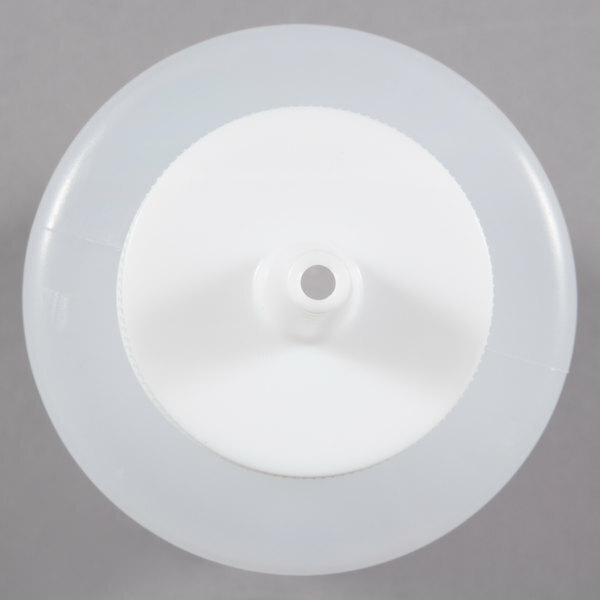 While its open tip eliminates the need to cut off the top, its tight, no-leak cap prevents accidental spills and messes. Capable of holding up to 12 oz. 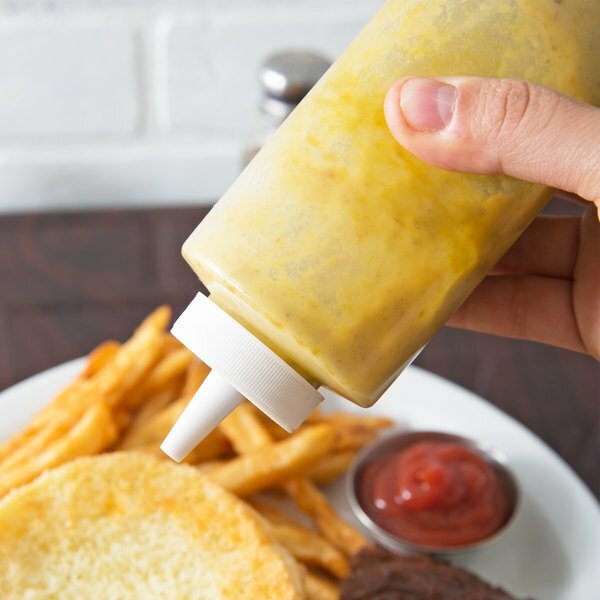 at a time, this squeeze bottle will accommodate ample quantities of your most commonly used condiments so that you refill the bottle less often. This product is awesome for holding sauce or oil. We send them out with catering orders so the customers may add sauce to their food easily. 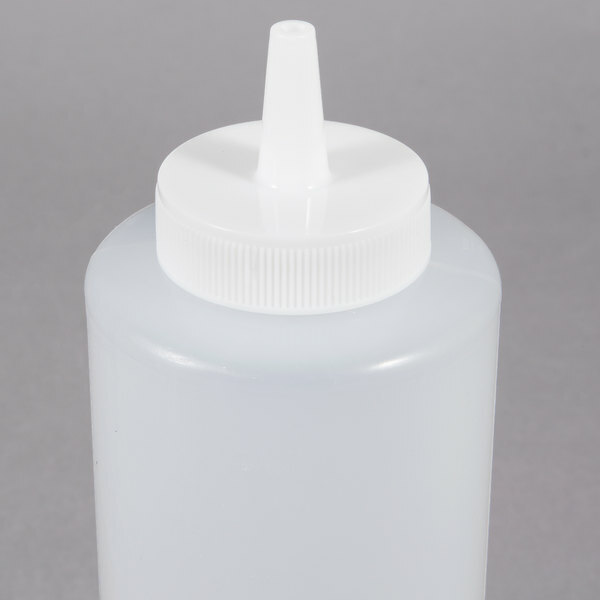 We use these bottles to store water based paints and stains. They keep the paint fresh and are easy to clean (paint peels right off). Being clear - we can see the paint color, plus labels stick very well to the exteriors. Can't get enough of these squeeze bottles, we use in house for everything from oil, dressings, hot and cols line, even keep a few for soap on the dish line. These are adequate and should serve your saucing needs. However, my biggest complaint is that the nozzle is a bit narrow, meaning chunkier or thicker sauces struggle to pass through. The plastic quality is also not great, but fine for the price. 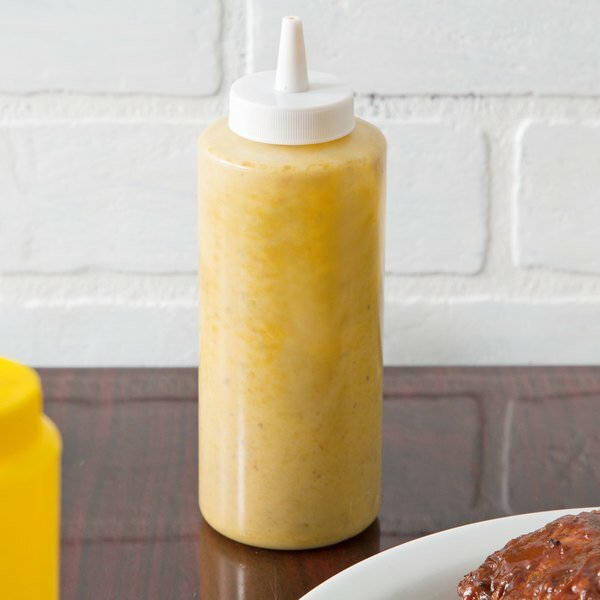 These squeeze bottles work great for our barbecue sauces for bulk drop off caterings. Being a barbecue restaurant that has 4 homemade sauces, we needed a lot of bottles and the savings are incredible. We did have to cut the tips of some of them to allow thicker sauces with crushed red peppers to come out. We prefer the wide mouth 16oz at the tables for refilling, but the classic 12oz works good for bottles we aren't getting back when we don't need to provide as much sauce. Simple and durable but a real pain to clean. I would suggest getting baby bottle scrubby flexible scrubbers and keeping them on hand. Otherwise, you'll always have residue. Perfect container for dispensing cinnamon roll icing. Good size for housing a full morning’s icing needs and the piping tip cover is used on it fits just fine! These squeeze bottles are adequate for the price point. I wish the opening was a little bigger since it can be difficult to pour in thick sauces. Very convenient bottles for my toppings. The hole is just right, not to big where it comes out fast or leaks. Don't have to squeeze to use. These clear squeeze bottles are a MUST for any kitchen. We use them to store all our specialty condiments and sauces, for quick and easy toppings on our dishes. They are very durable and easy to clean. These 12oz clear squeeze bottles are fantastic for sauces that you don't use as often, as well as for using beer while cooking on the flat top. 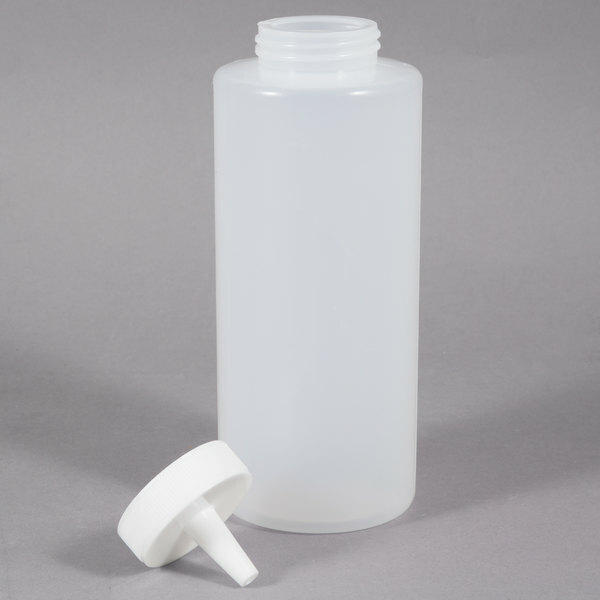 This is a simple, durable clear squeeze bottle that has served us well. This item cost considerably less than elsewhere and provides the same basic functionality. A+ item as described. We use this in our ice cream shop for drizzles of caramel, chocolate, honey, etc. The 12oz. size is smaller than some of the other sizes, but perfect for our use. 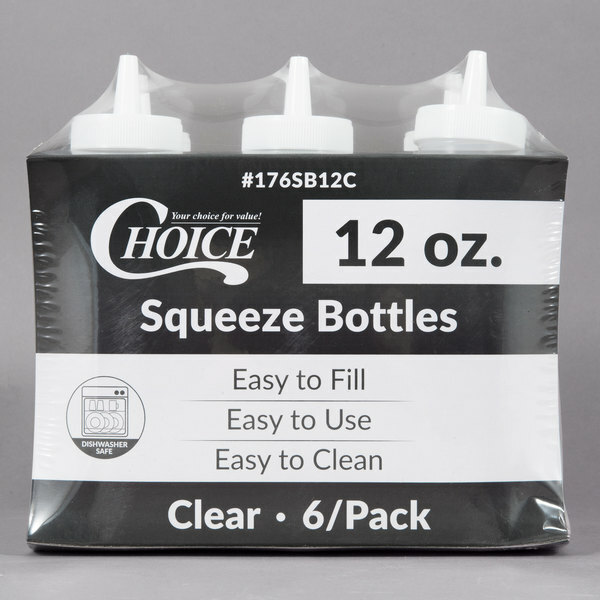 The Choice 12oz Clear Squeeze Bottle 6-Pack is a great buy for the price, much better than to buy by piece. Wide mouth is very helpful during refills and also for scrubbing clean. Great squeeze bottles. Exactly what I was looking for in this product. The price is also one of the best for the quality of the product. Solid squeeze bottles, when cutting the tips they tend to be a little brittle as with any economy choice product, though they do absolutely fulfill all needs. One of the best Clear squeeze bottle. Keep all the dressing clean. Easy to work and make your job more organized. And it's cheep for 6 packs.